This model features a two piece top. One 24" width by 24" depth adjustable drawing surface with soft close feature and one 12" width by 24" depth reference piece. Unit also has a 13"width by 20-1/2" depth by 2" height center drawer. Unit constructed of solid maple with 2-1/4" maple legs. Measures 36" width by 36" height by 24" depth. If you have any questions about this product by Diversified Woodcrafts, contact us by completing and submitting the form below. If you are looking for a specif part number, please include it with your message. 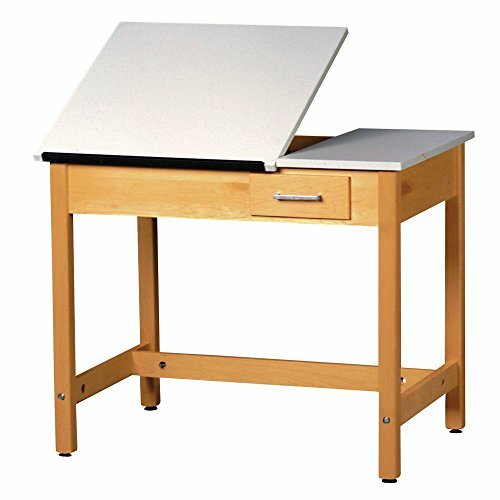 Bieffe Artist Adjustable Drafting Table 30x42"